Will GivMohr bill my insurance? Does private insurance cover the purchase of a GivMohr Sling? What size GivMohr Sling do I need? 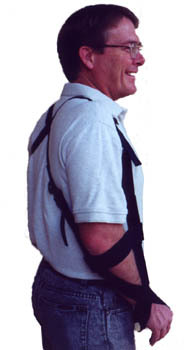 How can the GivMohr Sling help me? What is the best way to wash my GivMohr Sling? What are the shipping options for International orders? Are there any additional charges for International orders? We do not bill any insurance companies. We cannot guarantee that your particular insurance policy will cover the purchase of a GivMohr Sling. We suggest that healthcare professionals use billing code L3670. However, in no way do we guarantee or imply claim reimbursement or coverage. GivMohr is not responsible for final decisions made regarding codes submitted for our products. Our products are considered "hygiene" items, which are normally not returnable. 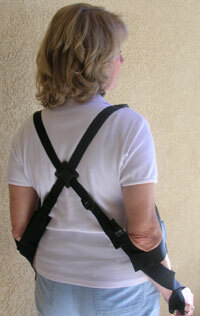 However, we recognize that there are times when you purchase a sling that you cannot use. If your sling was purchased directly from GivMohr Corporation within the past 30 days (based on the invoice date), you can contact us via email to request a return authorization. In some instances, we may contact you by phone or email to request more information before agreeing to accept your return. If we agree that you can return your sling, we will provide you with a return authorization number. If you purchase a GivMohr Sling directly from GivMohr Corporation and it turns out to be the wrong size, contact us via email within 30 days of the purchase date (based on the invoice date) so we can work together to determine the correct size. If we determine that a different size is needed and your sling should be returned to us, we will provide you with a return authorization number. If we send you a replacement sling, you will only pay for the shipping charges to return your original sling. Please refer to the sizing guide for general sizing information and sizing tips. If you cannot determine which size to order, you can contact us via email and we will be happy to help you with your decision. The preferred method for washing the GivMohr sling is to Hand Wash the sling in cold water and lay it flat to dry. If you want to wash the GivMohr Sling in a machine, use Cold Water and the Gentle wash cycle. We also recommend that you put the sling in a mesh laundry bag. To avoid damage, the GivMohr Sling should never be put into a dryer. All International orders must be placed online using our SECURE Shopping Cart and a major credit card. To place your International order, please click here. How does GivMohr ship International orders? UPS Ground to Canada (recommended) - this is the most cost-effective service to Canada and provides door-to-door shipping and online tracking through UPS.com. USPS Priority Mail International - this air service offers quick delivery (usually 6-10 days), but does not offer tracking once the package leaves the United States. USPS Express Mail International - this air service offers faster delivery to Canada (usually 3-5 days) and complete online tracking through USPS.com. USPS Priority Mail International (recommended) - this air service offers quick delivery (usually 6-10 days), but does not offer tracking once the package leaves the United States. USPS Express Mail International - this air service offers faster delivery (usually 1 week or less) and complete online tracking through USPS.com. Any import fees, including duties and taxes, are always the responsibility of the recipient. Please note that your order may not be delivered until these fees are paid.